Soybean oil is the most common oil used in the US, but this is a relatively new phenomenon. Prior to 1900, cooking was done with lard and butter, and the processed foods that are now primary sources of soybean oil (and other soy ingredients) were nonexistent. In the 1950s, saturated fats  were condemned on the basis of them raising your cholesterol and causing heart disease – a theory that has since been proven wrong, but which is still lingering in medical offices and public nutrition regulations. Partially hydrogenated soybean oil was developed to replace saturated fats like butter and lard in the food supply. Not only did consumers embrace it, but food manufacturers did even more so because of its low cost, long shelf-life, and stability at room temperature. There was just one problem: partially hydrogenated oils are sources of trans fats, which are now known to cause chronic health problems such as obesity, asthma, auto-immune disease, cancer, and bone degeneration. Yet, even if you take the hydrogenation process out of the picture, soybean oil is still detrimental to your health. While trans fats are now being pulled out of processed foods due to their extreme health risks, soybean oil is still fair game… but it shouldn’t be – and here’s why. Their results show just how very backward most nutritional advice is when suggesting vegetable oils are better than saturated fats…Mice fed a high-fat diet from coconut oil remained healthy, but when soybean oil was added in they had significant increases in weight gain, body fat, diabetes, glucose intolerance, and insulin resistance. The addition of soybean oil proved to be even worse than fructose, the latter of which did lead to rectal prolapse and fatty liver. 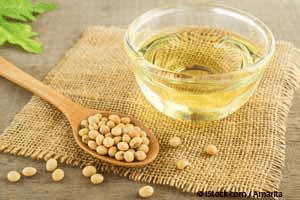 Conventional soybean oil contains about 55 percent linoleic acid, which is a polyunsaturated fat. DuPont has created a genetically modified (GM) soybean that is lower in linoleic acid and higher in oleic acid, which is the heart-healthy type found in olive oil . But are GM soybeans really healthier than non-GM varieties? According to a study presented at the Endocrine Society’s 97th annual meeting in San Diego, California, just barely. The GM soybean oil posed all the same health problems as conventional soybean oil, including inducing obesity, diabetes, and fatty liver in mice. It did not appear to cause insulin resistance, which was its one purported benefit. Still, swapping out regular soybean oil for a GM version is clearly not the answer. No one knows what the long-term health effects will be, and what we’ve seen with current GM products on the market provides little reassurance. Further, Monsanto’s “Roundup Ready” soybeans are genetically modified to survive otherwise lethal doses of glyphosate, the active ingredient in the company’s herbicide Roundup. Monsanto has steadfastly claimed that Roundup is harmless to animals and humans because the mechanism of action it uses (which allows it to kill weeds), called the shikimate pathway, is absent in all animals. However, the shikimate pathway is present in bacteria, and that’s the key to understanding how it causes such widespread systemic harm in both humans and animals. Glyphosate causes extreme disruption of the microbe’s function and lifecycle. What’s worse, glyphosate preferentially affects beneficial bacteria, allowing pathogens to overgrow and take over. In the interview above, Dr. Seneff reviews a variety of chronic diseases, explaining how glyphosate contributes to each condition. So to learn more, I urge you to listen to it in its entirety. It’s quite eye opening. Unfortunately, this advice will worsen rather than improve your health, as eating too much damaged omega-6 fat and too little omega-3  sets the stage for the very health problems you seek to avoid, including cardiovascular disease, cancer, depression and Alzheimer’s, rheumatoid arthritis, and diabetes, just to name a few. Both omega-3 and omega-6 fats are PUFAs (polyunsaturated fatty acids) and they are essential to your health, but when omega-6 is consumed in excess, it becomes problematic — and even more so if it’s damaged through processing. One of the problems with PUFAs is that they are very chemically unstable, and highly susceptible to being altered and denatured by heat and exposure to light and air. The omega-6 linoleic acid group had a 17 percent higher risk of dying from heart disease during the study period, compared with 11 percent among the control group (those who did not receive any particular dietary advice). The omega-6 group also had a higher risk of all-cause mortality. Most of you reading this are now well aware of the dangers of partially hydrogenated soybean oil (i.e. trans fats), and that the US Food and Drug Administration (FDA) is in the process of banning them completely. That’s great news, but the question is, what is trans fat being replaced with? “I stumbled on this topic because a vice president of [IOI] Loders Croklaan, a big fats and oils producer, said to me, ‘I just heard this terrifying talk by a man in a company who does all the cleaning for fast food restaurants.’… He said they have been having problems since restaurants started getting rid of trans fats in their fryers around 2007… The new oils were building up gunk in the drains and on the walls. The other issue is that, as trans fats are being replaced, restaurants and food service operations are reverting back to using regular vegetable oils (such as peanut, corn, and soy oil) for frying. But these oils still have the worrisome problem of degrading into toxic oxidation products when heated! More than 100 dangerous oxidation products have been found in a single piece of chicken fried in vegetable oils , Nina says.